Anyone who embarks on a journey of building a house will quickly discover there is a lot to learn, with many decisions to be made along the way. Designing the blueprint for your home is one of the first steps, and the more you know about the process, the more confident you can be. In this blog we share some tips for deciding the right orientation, room layout and room size for your home, and we show you three tools Urban Homes provides to make the process more informative and enjoyable. Positioning your home so that you have maximum sunshine year-round is key for a warm, dry, energy-efficient house. Your main living areas should face north, such as the kitchen, lounge and dining room. Your windows should also be positioned to make the most of the sun. If you have eaves over the northern windows, these should be wide enough to keep the sun out in summer, but not so wide they block it out during the winter. If you’re going for large, floor to ceiling windows, you may want to consider the amount of glazing to the westerly facing side of your home because this can cause glare and overheating from late afternoon sun. Glazing facing east captures the morning sun but the positioning of these windows needs to be considered to minimize glare on surfaces that are used in the morning (like the kitchen bench). South-facing windows won’t see much sun, so these need to be small to minimise heat loss. Check out the Smarter Homes website for more information on positioning your home. 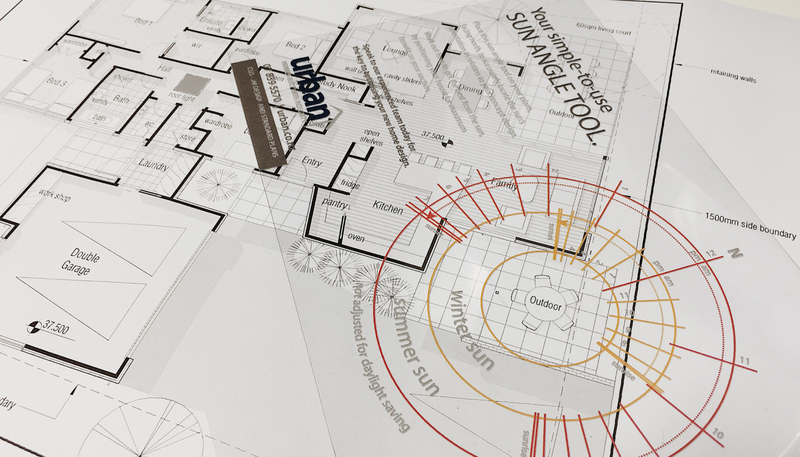 We’ve designed a sun angle tool that you can use alongside your plans to know where the sun will hit each room at certain times of the day and year. Your Urban Homes sales consultant will show you how this tool can be used. If you’d like to get your hands on a free copy, please contact us. The layout of the fixtures and furniture in your new home can mean the difference between floating around with ease, or feeling awkward in rooms. When deciding the best room layout, it pays to consider your furniture and how you want this to fit. How many people do you want to sit at the dining table? What size table do you need? Your children might be in single beds now, but will they graduate to double? Is your spare room going to double as a study? If so, do you need space for a desk? It also helps to think about what kind of activities you want each room to be set up for. Do you want the TV to be the focus point of the family room? Or would you rather have it set up for conversations? Do you want a fireplace in the lounge? If so, how will the seating need to be arranged? We’ve developed a room design layout tool which you can use alongside your plans to help you visualise your furniture inside your home. This tool will help you establish how your room layout works, and determine if the size and layout suits you, or if it needs to be adapted. Our scale ruler can help you establish the size of any room, and the space between furniture – it’s a great partner to the furniture layout tool. Designing a home might be new grounds for you, but it doesn’t have to be a daunting task. With our experienced Hamilton-based team to take you through the journey, and the right tools at your fingertips, you can glide confidently through the process. If you’d like to speak to us about your building plans, or get your hands on our toolkit, please contact us. Previous PostPrevious How much does it cost to build a house?